Comments: BBQ Burgers feed the hungry pilots on-hand. Ken Solo's on his way to a Glider Add-on. 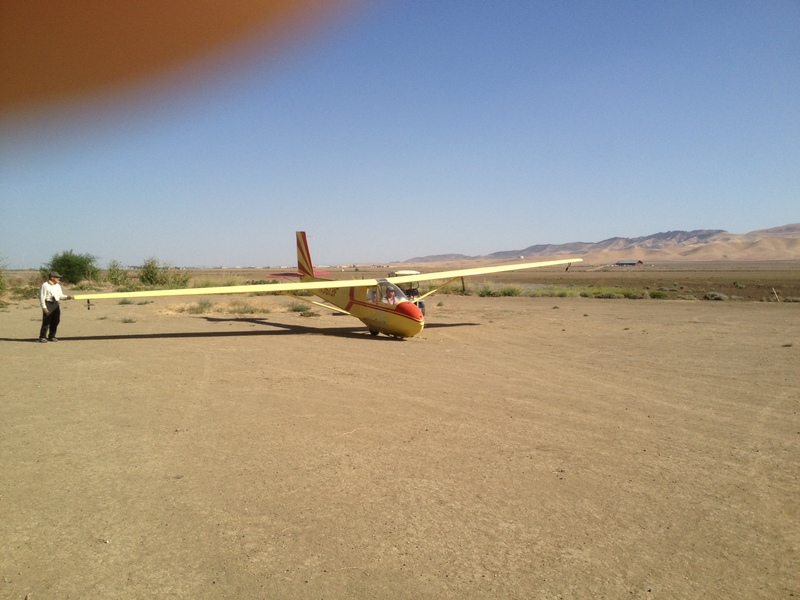 Congratulations to Ken Chaffee who soloed in Big Bird on Saturday. 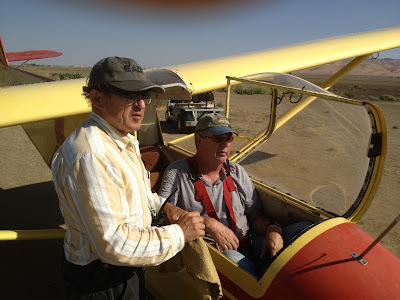 Ken is a power pilot and had had training before in gliders at tehachapi a few years ago. He continued with us and soled in the 2-33. He towed to 2000 ft and had some lift and climbed for a while before making a good pattern and landing. Alex providing some last words of advice. "Follow the rope Ken." wing low into the late afternoon crosswind. Ken rolling out wings nice and level after a safe flight. Jim Rickey also had his first glider flight and lesson with a one hour flight reaching 5900 ft. msl. He got in quite a bit of stick time and did considerable thermalling and did the pattern and landing. Jim is also a power pilot, and has a Cessna 210 he keeps at Hanford. He attended our ground school last winter. Jim is also a CFI. New CFIG in the works? Yutaka Buto flew wth me in prep for adding the glider CFI on to his power CFI. He also took up his son for a flight and then flew the towplane after Andrew hd towed earlier for us. Harold was turning and burning training flights the better part of the day. Keith Curry is a returning member from many years back. He's back in the glider working on his Add-On rating now. Peter Mersino was hard at work at his soaring skills as well. Good thing or else he's going to earn the Slipping Tortoise award again for taking the longest to get his license. Peter Sahlberg won the coin toss between him and Richard Walker and got to fly their 1-35. Richard hopped in the 1-26 instead and seemed happy with the results. Both Richard and Peter had to take relights. There was a SE flow and the usual spots weren't working at first. Peter will hopefully post some more details of his second flight. He strayed pretty far from home according to his OLC trace. Getting as far south as Orchard peak and as far north as Coalinga although his batteries died in his logger cutting his distance short for OLC. Badges? We don't get no stinkin' badges. GD primed for a Diamond Goal flight. I (Morgan) finally flew GD after nearly a year. With the Duo in Cal City and conditions looking good at Avenal I opted for flying locally and Karl wasn't able to fly. I hadn't worn GD in a while and it felt good to be back in a glider that has treated me well. I had decided the night before to try for a Diamond Goal flight. I quickly reviewed the requirements and programmed a task into XCSoar and then uploaded it to the Cambridge 302 logger. Avenal -> Conover -> Avenal. A little over the required 300km distance for Diamond Goal. Task loaded, the day was getting late and I launched around 2:15. Quickly climbed out with Jim and Alex and realized I should dart in and make my start low enough to avoid a Loss of Height penalty if I was squeaking back in late in the day. Started the task, returned to Jim and Alex and climbed to 6k. I found a good line to the mountains, gaining as I went and then got to 10k at Black and started South. There were Cu over Soda Lake, 50 miles S of Avenal. I found a climb 1/2 way there for a couple thousand feet and raced in to Soda Lake to the first cloud and an obvious dust devil. I was rewarded with good lift, not to cloudbase, but close enough and over 10k. From there I followed markers and then had to take a detour across the Cuyama Valley and over to the Sierra Madre mountains closer to Santa Ynez. The clouds marked the convergence well and it was easy to find a climb after crossing the valley. 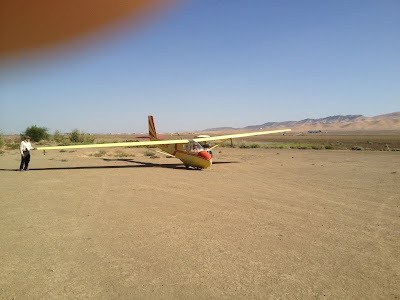 Julie had texted me before takeoff that there were huge dust devils in the Cuyama Valley. At 3:45 they were still churning and showing the convergence line. Over the Sierra Madre range I was able to make good time near cloudbase at around 11k. Heading East along the convergence. Pine Mountain is just under the yaw string. It's 15 miles or so NE of Ojai. The clouds wrapped around with only a short gap to Mt. Pinos and the Frasier Park area. No circling required to cross the gap and connect with the powerful clouds over my turnpoint. The line was so good I got a little greedy despite it being 4:30pm as I approached Conover. I tagged the sector for my task, then pushed on another 10 miles or so to the end of the cloudstreet. 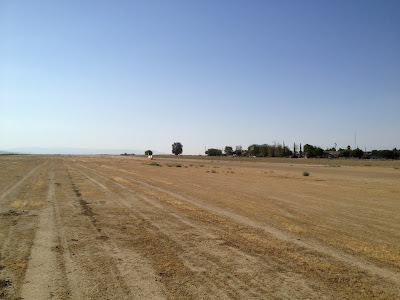 I turned just over 100 nautical miles out from Avenal. Leaving Pinos at nearly 12k I headed for a cycling cu 30 miles away at Caliente Peak west of New Cuyama. I figured I would reconnect with the convergence for an easy run to within final glide. Well, it wasn't really working when I got there. I headed across the CA Valley along the former line of Cu that had now dissipated. Nothing. No signs of lift. No birds, no dust devils, no dust, no ponds for wind indicators. It wasn't looking good. 5 knots sink for a long time had me a bit concerned. I could clear the Temblors and make Taft easy enough, but I really didn't want to land out, especially that far from Avenal. I figured I must be west of the convergence and headed east towards the ridgeline. Just before the ridgeline at around 5k I hit some smooth and consistent lift and began to work it. 2-3 knots all the way around. Then I spotted a dust devil to my east another 1/2 mile. I worked my lift for a little more altitude and then pressed farther downwind. Sure enough 5-8knts to over 8000ft. Back in the game I reported in to Peter who was still flying. The run home was a little slow, but generally uneventful. Convergence/shear lift over the Temblor range that defied circling, but suckered me a number of times. A final climb about 30 miles out gave me final glide. I talked to Alex when I was around 20 miles out and told him I was fine. I just bumped along the convergence at 75knots or so, not willing to turn anymore. That took me nearly to Coalinga before it was time to head for home and tag my finish sector. Winds were 90 cross when I got back to the airport around 6:30. Let me land on 13 and roll straight to the trailer. Thankfully we have a one man rigger although it was still very hot and I had to take my time putting GD back in the box. I now have a much better understanding of how to screw up a badge flight so hopefully I can figure out the details to get it right and we can start claiming some badges out of Avenal for members. See you at Avenal Soon. August 10, a bit cooler and very good soaring.